Please read a report of our actions in Al Jazeera. Hi. This is a piece that took a while to get together. I worked alongside a reporter who normally spends his time reporting from war zones all over the world. He had read my newspaper reports and this blog, and felt the need to report on our activities. As you can imagine this man has seen lots of bloodshed and fighting, as a result he isn’t easily shocked. 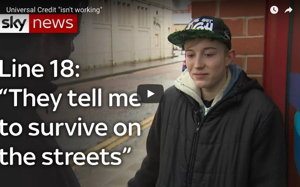 However after spending a few days outside the Jobcentre with us he was moved to tears. He couldn’t believe the hardship and cruelty that is inflicted on the poorest in our country. He said it’s as bad as reporting from a war zone, instead of bullets they are starving people into submission. He said that he would never forget this. He’s an amazing man. 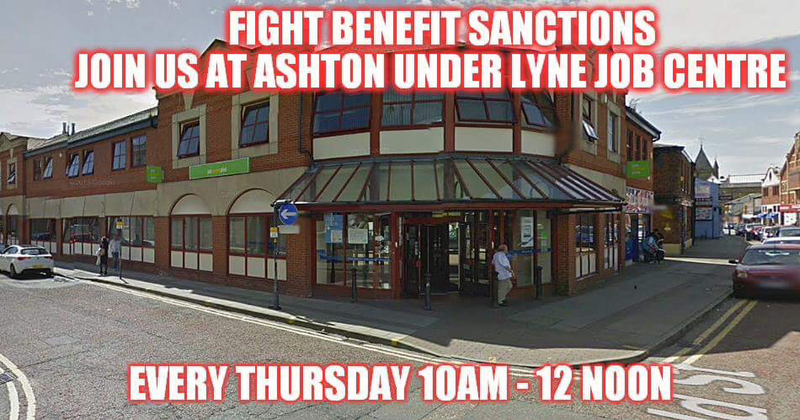 Filed under: Ashton Under lyne, dwp, hunger, JObcentre, starvation, suicide, tory. Thursdays weekly demonstration. Desperation is a constant fiend for claimants. It is amazing how quickly these punitive attitudes have become the new ‘normal’ in society. The unemployed and now the disabled made the targets of these vicious policies, by a government that has done so quite deliberately. A million people using foodbanks, jobseekers left to starve, and in some cases, die for missing a Jobcentre appointment. Yet even now you meet many people who are unaware of the real situation, and who don’t believe that anyone can be deliberately left without food for months as a punishment. Please forgive my grammar, it’s the onset of Dementia (sorry)! Excellent articles both by you and,the AJ journo. However, reading the “comments” in AJ), big mistake! The bile that some people vent upon the disabled/unemployed is gob smacking.